Published on September 8, 2009 in Finance, General T&T, Media, PNM and Politics. 10 Comments Tags: Karen Nunez-Tesheira, Patrick Manning, Politics, Property Tax, T&T Govt. 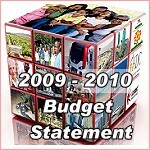 The text of the 2009-2010 Budget Statement as was presented in the House of Representatives on Monday, September 08, 2009, by the Minister of Finance the Honourable Karen Nunez-Tesheira. Mr. Speaker, it is a distinct privilege to present to this Honourable House and to the people of Trinidad and Tobago the 2009/2010 Budget. This is the second budget of this Administration in which we continue to implement a progressive programme of development intended to improve the quality of life of our nation’s citizens. Mr. Speaker, it is almost impossible to personally thank all the people whose ideas and advice have helped to shape this Budget. However, a very special word of thanks is due to the officers in the Ministry of Finance whose professional skills, patience and patriotism led to the preparation of documents laid before this Honourable House today. I wish also to thank the many individuals and organizations who contributed a slate of ideas which served to inform the Budget. My profound appreciation is also extended to the Honourable Prime Minister and my Cabinet colleagues who share with me collective responsibility for the integrity of this Budget. Government yesterday launched a major crackdown against traffic offenders by imposing a range of hefty new penalties against them in its $44 billion Budget for 2010. Drivers of heavily tinted National Security vehicles may also face the new fine of $2000 introduced in the 2010 Budget, Finance Minister, Karen Nunez-Tesheira said after her presentation yesterday. President of the pre-owned Automobile Dealers’ Association, Inshan Ishmael, says the 50 per cent increase in motor vehicle transfer tax, announced during the 2009/2010 budget, will not affect motorists in any way. Leader of the Congress of the People Winston Dookeran is describing the 2009/2010 budget as one of bankruptcy. Opposition Leader Basdeo Panday yesterday described the 2009/2010 fiscal package for the country as the most shameless budget he had ever heard. The Trinidad and Tobago Chamber of Commerce has described yesterday’s 2009/2010 budget as a “continuation of previous budgets”. Since the demolishing of the Grand Stand in the Queen’s Park Savannah in 2006, construction work on a National Carnival and Entertainment Centre (NCEC) has been promised to commence each year. THE National Security Ministry was allocated $4.1 billion in the 2009/2010 Budget, an increase of $263 million as announced yesterday by Finance Minister Karen Nunez-Tesheira. THE announcement of a 15 percent increase in cigarettes, tobacco and alcohol has come under heavy fire and criticism from citizens in Port-of-Spain shortly after Finance Minister Karen Nunez-Tesheira completed her three-hour 2009/2010 Budget presentation. Perhaps the most significant statement in the budget speech, is the posibility of enforcing the child safety laws in motor vehicles. Enabling legislation must be accompanied by public education, on every media outlet. NO Child should ride in the front seat of a car or truck, no matter what age. Children should not ride in the open tray of a truck, not if they are under sixteen. Vehicles carrying children must assign one seat per child, with no one sitting on the lap of another. (Airlines allow this but both parent and child must be buckled in. A child paying the 20% fare MUST have a safety seat. That is international law.) In rural areas, we still see gross violations of road safety, by vehicles involving children. People back into major roads, endangering others, especially children. It should become law that people parking in their garages or on driveways, should back in, so that in moving out again, they nose out into the street. The traffic branch of the police service must be beefed up, and fines become steep enough to serve as deterrents. If there is a scale of fees, every police officer on the roads should be equipped with a laminated chart of those fees, signed by the chief of police. The enabling legislation must allow the officer to fine on the spot, via ticket, and to confiscate the vehicle if that is deemed appropriate. After the first five or so parents have to call someone else from the police station, to rescue them and the child who was riding in the front seat or riding without a safety chair, the nation may get the impression that the police are serious. Signs should be posted on every highway as reminders of the force of this new law. Our children are our future. Sometimes we need drastic action to save them from careless parents. These penalties should have been upgraded a long time ago, however it needs to be properly thought out so that its results are balanced and not just about filling government coffers. In respect to tint, the Motor Vehicle law is not very clear as to what constitutes ‘illegal tint’, thus there is a lot of subjectivity on the part of police/licensing officers as to whether a particular tint on a vehicle is illegal. Leaving such an important matter potentially up to the whims and fancy of officers opens citizens up for abuse. There has to be a more objective process for determining whether a particular tint is illegal, such as the use of a tint meter which measures the percentage of light that passes through a window. The process has to be upgraded along with the penalty. Property owners will face stiff taxes from January 1 next year. The 2010 national budget measure proposed by Government seeks to implement a new Property Tax Information System to assess properties and collect taxes. But several experts have suggested that the system will force homeowners and commercial customers to pay thousands of dollars in new taxes and will also affect mortgage activity. Economist Dr Patrick Watson said yesterday the property tax regime will “increase the burden of an already overburdened middle class” in the country. He was speaking at a post-budget forum held at the Chamber of Commerce, Westmoorings. Watson calculated that people who current paid less than $300 a year in land and building taxes might have to pay more than $3,000 per annum. I would recommend that homeowners who are pensioners over sixty-five, or seventy, living in single family dwellings, not cut up into rooms and rented, should get the sort of tax relief on their property that other developed countries provide. My property taxes were frozen, by my state, when I turned 65. My neighbour pays more than $800.00 more for the same sized lot and house.Other states and countries also provide relief. If the value of a 2×4 box in TnT has quadrupled twice in the last ten years, then property taxes should reflect that increase also.These taxes provide potable water, subsidize electricity and pave rods, which, even with potholes, are still better than no roads. The average homeowner in TnT pays very little compared to what others pay elsewhere.The system has to be equitable, that’s all. The caller agreed with Nunez-Tesheira’s announcement in the budget statement that the property taxes need to be reformed, but said now is not the time for this to be done as the country is still in the midst of an economic downturn. FORMER Central Bank Governor Winston Dookeran said on Tuesday, it appeared that Government was now looking at taxing citizens and borrowing more money, because the money in the nation’s coffers had run out. In the context of the economic downturn, Government spent substantial sums on make-work programmes in 2009 as part of its employment generation initiative. Some $442 million was spent on the Unemployment Relief Programme (URP) and $300 million on the Community-based Environmental Protection and Enhancement Programme (CEPEP) in 2009, amounting to a total of $742 million. Land and property owners will have to start paying new, increased taxes from March 31 next year. Imposing a hefty fine for illegal tint, while there is still no clear cut law to determine what exactly a legal limit is, is illegal, the Trinidad and Tobago Automobile Association (TTAA) has said. Over the past week, all serious commentators have analysed the Budget, but now I am going to do so. In order to understand the 2009-2010 Budget, and all Budgets for the past eight years, you have to understand the principles, perspectives, and PNMs that inform the various measures. Without this, you may fall into the trap of looking for economic ideas, policy measures, or common sense. This is not about reform or equity. It is simply additional taxation in deficit budgeting brought on by squandermania in a time of plenty. If you fail to pay, Government will simply seize your property. An ill Opposition Leader Basdeo Panday yesterday delivered his first budget reply in four years, dismissing the Government’s $44.4 billion fiscal package as fluff with no plan for taking Trinidad and Tobago forward. A $15-$20 minimum wage; a farmer’s insurance scheme; an increase in the disability grant; an increase in the old-age grant to $3,000, indexing of it to inflation; an increase in the compensation of victims of crime from the current limit of $25,000 to $250,000; and the stopping of the Alutrint plant. Caroni East MP Dr Tim Gopeesingh said corruption is King in T&T. He told members of the Lower House during yesterday’s debate on the 2009/10 national budget that there was no accountability of leadership and no trust in authority in T&T. Homeowners are being punished by the Government for achieving their goal of home ownership by having to pay the increased property taxes, says Opposition MP Winston “Gypsy” Peters. DESPITE an impromptu musical interlude which interrupted its 10 am sitting, the House of Representatives yesterday passed the $44 billion Budget for 2010 at 1.48 pm. ST Augustine MP Vasant Bharath hit the raft of tax-hikes proposed in the Budget as “callous and heartless”, especially for the poor, as he spoke in the Lower House on the orders to impose these increases. Property owners on a fixed income will receive a waiver or a reduction in the proposed increased property taxes once they can prove to the Board of Inland Revenue or its replacement, the Trinidad and Tobago Revenue Authority, they are in an impoverished financial position. Consumers can expect an increase in water rates after the Regulated Industries Commission (RIC) completes its review of WASA’s current rates, Harjinder Atwal, Executive Director of the RIC warned yesterday. Government expects to collect $250 million in revenue in the short term and $750 million in the medium term from properties taxes, Finance Minister Karen Nunez-Tesheira said at yesterday’s post-Cabinet news conference at the Diplomatic Centre in St Ann’s.